“Houston, we have a problem”. I am sure you all know this famous line from the “Apollo 13” movie. Or at least familiar with the story of the unfortunate lunar mission that inspired the film. In 2017 another space docudrama was released, a Russian movie “Salyut 7”, directed by Klim Shipenko. The movie tells a lesser known story of the Soviet Space Station Salyut 7 and a brave crew of two cosmonauts sent to the Station to carry out emergency repairs. We were happy to discover that Amazon is currently streaming “Salyut 7” (with English subtitles) with their Prime subscription. Highly recommend! Bear in mind, that even though the movie is based on real events, some episodes are grossly exaggerated or even entirely made up. Still, it is a great story of human bravery, engineering genius and being able to do things we never knew we were capable of. 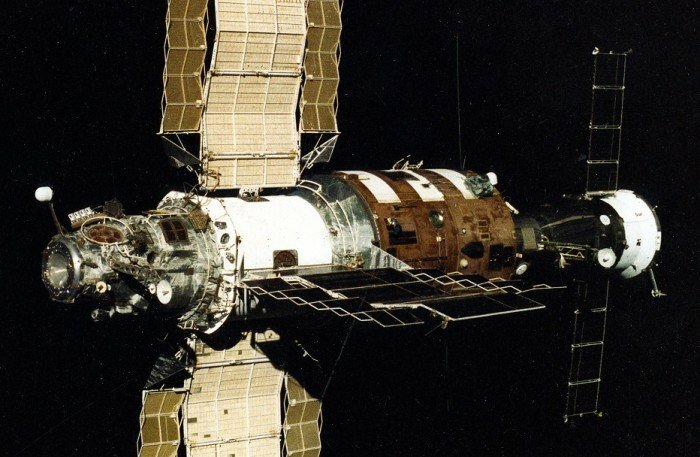 So what was Salyut 7 and what happened there in 1985? Salyut 7 was the last in the family of Soviet Soyuz Stations that operated in Space between 1982 and 1991. In February 11, 1985 Salyut, while orbiting in the automatic mode and having no crew on board, stopped responding to the commands from the ground. Engineers later determined that due to malfunction of one of the sensors, the whole electrical system shut down. The dead station started spinning uncontrollably. Moreover, without the constant correction of its orbit, Salyut started spiraling towards the Earth, threatening to crush anywhere on the planet between the latitudes of 51N and 51S. When the ground radars finally spotted the Station a few days after the loss of contact, scientists calculated they had about half a year to recover the Salyut 7 before it will crush into the Earth. Bringing the Station back to life was not only a matter of the national pride for Russians. They were aware that Shuttle Challenger was preparing for the start and feared that it will capture the station. At that time Russia and USA were in the middle of the Space Race (to learn more, see our Space Dome‘s lesson on Space Race ). Therefore getting hold of Salyut would have not only allowed American scientists to access the Soviet technology but it would have most likely provoked a conflict between the two countries. Mission Soyuz T-13 launched in June 6, 1985, four months after the loss of contact with the Station. 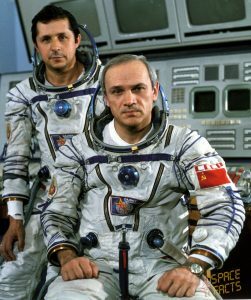 On board were two cosmonauts, Vladimir Dzhanibekov and Viktor Savinykh. The crew had to find Salyut, dock with the dead station (nobody has never done anything like that before) and perform the repairs. Dzhanibekov and Savinykh did the impossible! First, they hard docked with the Station. The next step was to find out whether there was still air inside Salyut 7. Turned out there was! Only when the crew entered the station, they realized how bad the situation was. Salyut was frozen! All the water was frozen too, meaning they only had the 5 days to fix the Station. That’s how long the supply of water they brought on Soyuz could last. The ventilation didn’t work properly, meaning the carbon dioxide accumulated around the cosmonauts. And the equipment was not designed for the subzero temperatures. Nobody, neither cosmonauts, nor ground engineers, knew whether it was going to work again. The two cosmonauts spent a week working around the clock in the freezing cold. They connected the batteries directly to the solar panels and used Soyuz engines to turn the Station to face the Sun. The batteries charged and they had the power back. As the station started to defrost, they faced another, even bigger problem, water! It was everywhere, covering all the equipment and electrical cables on Salyut. Dzhanibekov and Savinykh had to dry the station using all the rugs they could find around, even their space clothes! Once the station was dry, they could finally repair the communication system. And on June 13, the ground control received the first since February message from Salyut 7. The Station was alive and well! It stayed in orbit for another six years. By 1991 its orbit decayed and the station plunged into the Pacific Ocean. For Dzhanibekov it was the last space flight. Savinykh was a flight engineer for the expedition that visited Mir Station in 1988.